Twenty-Seven 23-Minute Messages. Over 10 Hours of Teaching. The 'Dust to Glory' series has given me an excellent overview of God's Redemptive Plan and how God carried out his Perfect Plan of Redemption through his only Son, Jesus Christ who died for sinners like me. 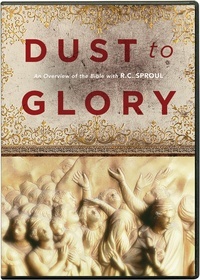 Dr. Sproul has been able to answer so many questions I have had about the Holy Scriptures in his lectures series, 'Dust to Glory.' Not only have I learned so much more about the Bible, the main Biblical characters involved in Redemptive History, but also how these Biblical characters were used by God to carry out His Perfect Plan of Redemption. I highly recommend All Christians wanting to walk and grow closer to God in their spiritual walk with Jesus Christ, should view the series. I am now watching the series, 'Dust to Glory' for the second time taking notes as I go. Dr. Sproul, Thank you for all you have done for the Glory of God. You are always invited to come to the Pentagon and minister to us here. One day I would love to meet you, if not now, in Heaven.